I hope you all had a wonderful weekend. It is that time of the month again when I start dropping things. You know what I mean? I dropped down a few eye make-up and managed to break them. I cant wait until this is over. All I am doing is now getting miserable and curling on the sofa. Today we attended a brunch party of a good old friend, which was fun! Oh and I ate too much. Give me sweets and leave me alone. Gorgeous X-mas palettes are all over now. I have a few(!) to show you in the upcoming weeks. 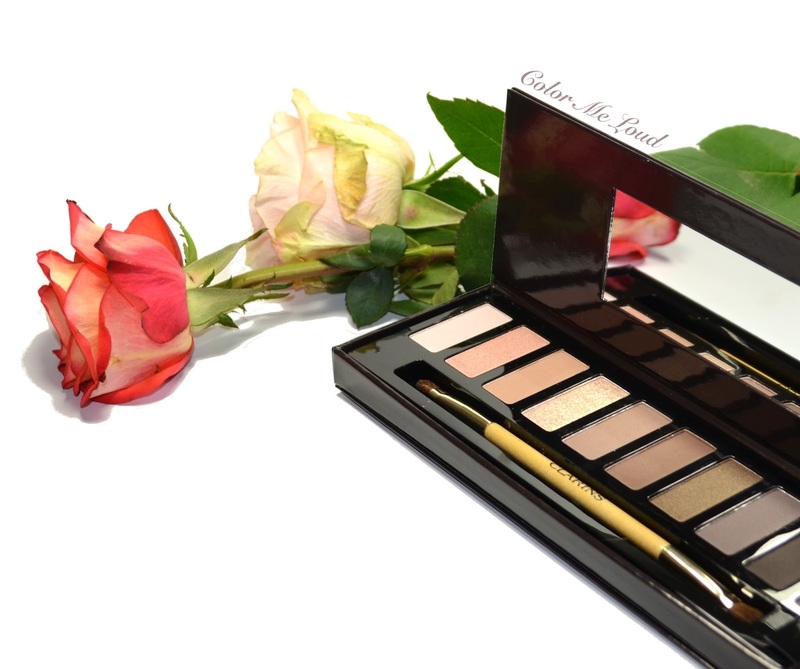 I would like to start by Clarins' Holiday Collection The Essentials Eye Make-Up Palette. Ten-pan palettes of Clarins' have almost been a tradition now. I fell in love with the one from 2013 but didn't pick it up last year since I thought they were similar. This year's is more smoky with a good balance of matte and shimmery shades. 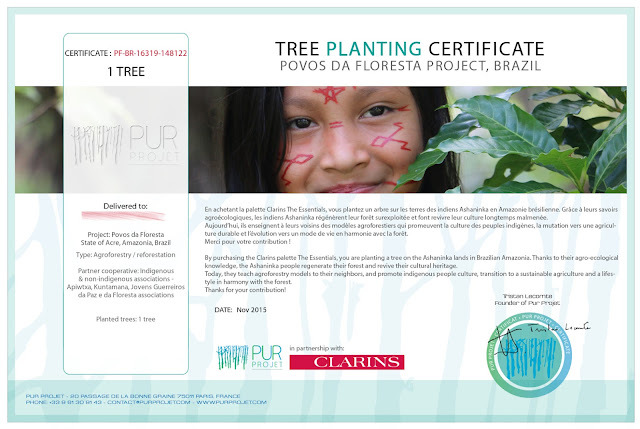 Also this year Clarins came up with a wonderful idea of planting a tree in Brazil for each Palette. I am loving this idea. I wore the palette a couple of times during the last week. My thoughts about it is after the jump. 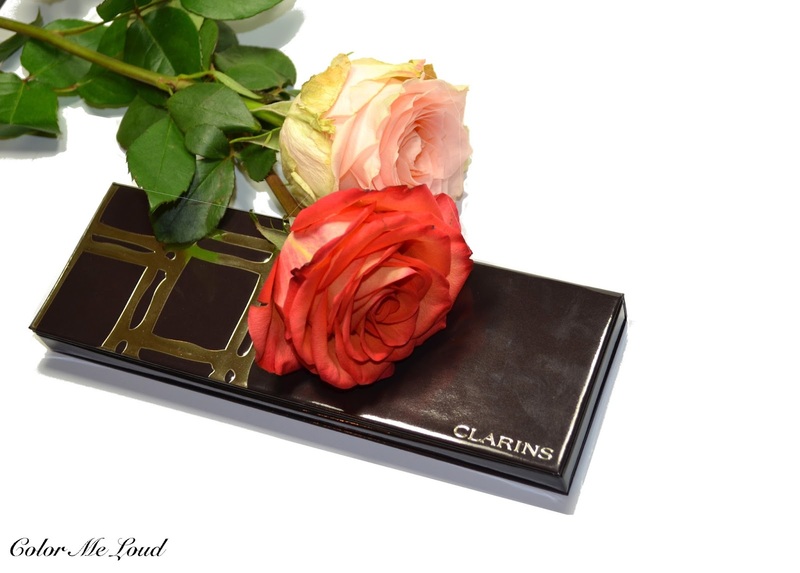 Clarins The Essentials Eye Make-Up Palette is hosted in a recycled cardboard package. Inside the compact, the part where the eye shadows lay is made of plastic and can be taken out of the cardboard box. This makes it reusable. The attention given to the environment is exemplary. Not to mention how chic the card board looks. #1 (left most): A very light cool pink with matte finish. Unfortunately the color pay-off of this one is not very good but it can be used to blend over the crease. 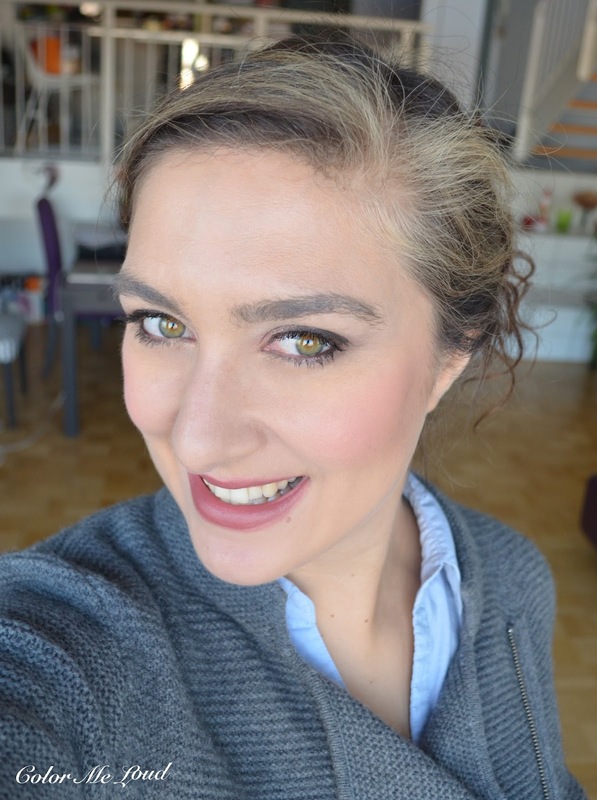 #3: A light to medium cool tan shade with matte finish which is great to introduce a light crease on my complexion. This would make a good contour shade for the nose or face as well. It is a little powdery and the color pay-off is medium but works fine on the eyes once applied with a fluffy brush. #4: A light neutral gold with metallic finish. This shade is wonderful if you know how to use it but it also has the potential to ruin the eye make-up. The powder of this is very soft so it crumbles if zou pick it up with a dense brush or hands. The best thing is to pick it up with fingers and put some at the back of your hand and apply from there to avoid access. If you apply it right, it almost looks like a foil, very beautiful. #5: A deeper cool tan shade with matte finish. This is deeper than #3 with better color pay-off. It is also less powdery. I love this one to deepen the crease a little more. If you use #3 and #5 subsequently, you are guaranteed to get a nice blended look. #6: A deeper warmer brown with satin to matte finish. It has good color pay off and a nice buttery consistency. #7: This is one of my favorites (together with #2 and #10). It is an olive golden khaki shade with lovely complex shimmer. It has great color pay off. #8: A deep cool gunmetal with matte finish. Great color pay-off and consistency. #9: A very deep matte black. Blacks are very hard to do and I was a little afraid to find out how this one would perform after the Fall Palette (reviewed here). I am happy to report, this is one of the best blacks I came across at this price range for a long time. It is smooth and buttery, not powdery and has great color pay-off. It also layers well on the other shades. #10: My type of purple dot. Love! It has a satin finish and it is a great addition to otherwise neutral palette. 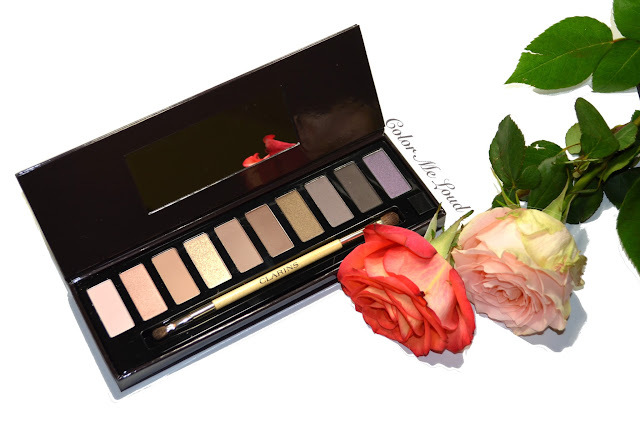 Now before telling how this works on the eyes, I would like to tell you that Clarins The Essentials Eye Make-Up Palette consists of mineral and plant extracts. These type of formulas benefit a great deal from wet application to get the full color pay-off which you see in the swatches. Instead I applied it dry since I know many of you don't go for wet application. The results are fine but the lustre is better if applied wet. This eye look lasted full day on me without fading and creasing. Here is a last look to Clarins The Essentials Eye Make-Up Palette. Final thoughts: Aside from a few shade, Clarins The Essentials Eye Make-Up Palette works well for a gradual neutral eye or a smoky eye. The shades perform better if used wet but they are fine if used dry as well. It is for a good cause and made up of recycled material which makes it easier to justify if you have many neutrals in your collection. Availability/ Price: Available right now online and in stores. It is limited edition and costs around 46€. How do you find the idea about planting a tree? Would you buy make-up for a cause? I like that they threw some purple in there and that it's not ALL neutrals. Overall it really looks like a nice palette. I love the look you created here. It looks very wearable, and love the cool smoky colors too! I think the palette is just ok, nothing too unusual but I love the tree planting idea and that you get to find out where your tree was planted! That's pretty cool! And you look so pretty with your hair up, Sara! This eye look is absolutely stunning on you and I agree, you look great with your hair up!! But OMG the star here is Bond Girl. Wishlisted. I don't think I would buy makeup specifically for a good cause. If I were torn between two products, however, the good cause may just sway me one way or the other. Otherwise I just donate to charities of my choice. I always appreciate effort put into preserving the environment during the production process, though.